Work is underway to secure part of the 'B of the Bang' sculpture outside the City of Manchester stadium. The 184ft (56m) sculpture, designed to look like an exploding firework, is made up of 200 solid steel columns. The tip of one of its 7ft (2.1m) spikes fell off in January, a week before it was officially unveiled by former Olympic champion Linford Christie. Some of the metal joints have been re-welded and equipment has been put up to stop the spikes moving too much. The sculpture is taller than the Angel of the North, in Gateshead, and leans at a greater angle than the Leaning Tower of Pisa in Italy. 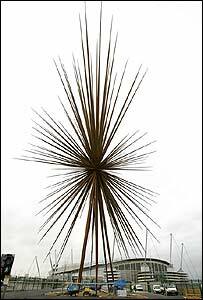 It was designed as a tribute to the 2002 Commonwealth Games and named after British sprinter Linford Christie's famous saying: "I'll be gone by the B of the Bang."